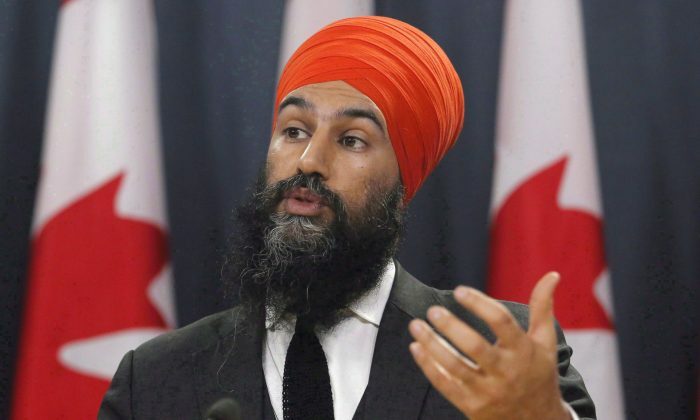 OTTAWA—NDP Leader Jagmeet Singh has issued a blanket condemnation of terrorist acts following media reports about his attendance at a California rally three years ago that sang the praises of Sikh separatism and a violent religious leader killed during the 1984 invasion of India’s Golden Temple. On March 14, Singh issued a statement in which he condemned all acts of terrorism, regardless of who is responsible, after the Globe and Mail disclosed that he attended and spoke at the 2015 rally in San Francisco, an event billed as a commemoration of Sikhs who died during the bloody 1984 invasion in Amritsar. Singh’s statement, which follows a report about the 2015 rally in the Globe and Mail, comes at a time of strained Canada-India relations, in part because of lingering Indian concerns that Canadian governments tolerate Sikh separatism and extremism by not speaking out against it. Balpreet Singh, legal counsel for the World Sikh Organization in Canada, said the demand that all Sikhs constantly condemn violence in general is not only tiring, it’s offensive. Balpreet Singh says the only violence people can point to happened decades ago and it is unfair to continually accuse Sikhs today of condoning violence because of the actions of others more than 30 years ago. He said Trudeau’s recent trip was “a massive disaster for the Sikh community” that set the community back decades in Canada. He said there are many Canadian Sikhs who felt let down by Trudeau on the trip for not standing up for them against Indian allegations that violence and extremism was coming into India from Canada’s Sikh community. The Liberals won a number of seats in the last election largely with the support of the Sikh community. There are more than half a dozen seats around Toronto and Vancouver where the Indian community accounts for more than one-third of the population and in two it makes up over half. The Liberals won all of these and many felt the trip to India was designed, at least in part, as a political reach-out to those voters. Trudeau spent much of the trip expressing Canada’s official support for a united India and condemning violence to quiet allegations within India that Canada supported Sikh separatism and that his cabinet included Sikh separatists. The government of Indian Prime Minister Narendra Modi has also expressed concern in the past about Trudeau attending Sikh parades and celebrations where there have been floats or events honouring people known to have been behind the 1984 Air India bombing. Some said Modi snubbed Trudeau in India by sending a junior minister to greet him at the airport, ignoring his visit for several days and only meeting him for part of one day near the end of the week-long trip.